Supt. 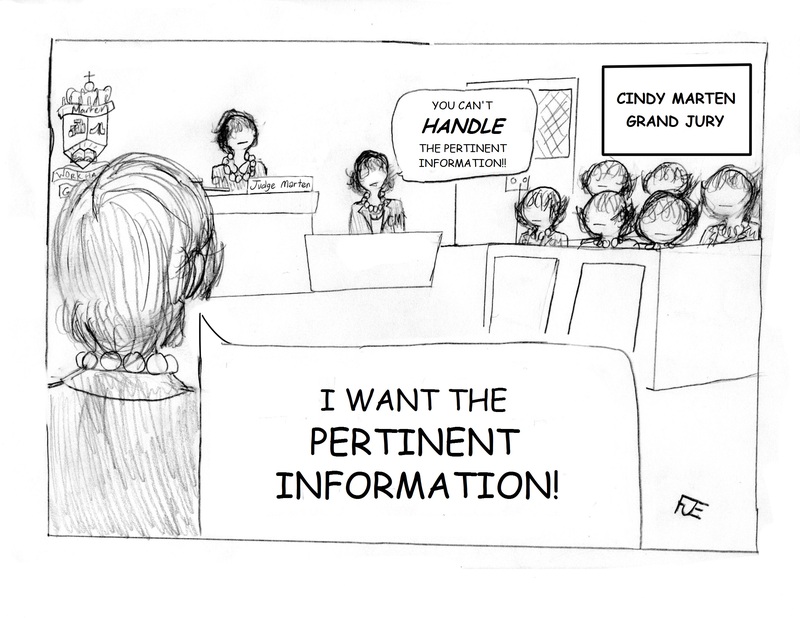 Marten…we said PERTINENT INFORMATION…NOT BIASED IGNORANCE! In the 6 days separating the Special Closed Session SDUSD Board of Education Meeting and the apparently approved release of confidential information of many innocent, unrelated San Diego Unified School District employees along with the Marten SCPA Alibi Statement, Marten was scrambling to gather and compile ONLY the selected information that could create a miniscule measure of plausible deniability of her and Trustee Foster’s OBVIOUS guilt. Marten did what we have become accustomed to Marten doing…she failed to do so miserably in the 9-29-15 Cindy Marten SCPA Support Documentation. When you review and analyze what Marten desperately put together in that 6 days you will find an out of sequence patchwork of documents, emails, notes and reports that exclude key events, documents, data and co-conspirators…that if revealed would completely deflated her weak attempt at an alibi for herself and Foster. Marten did the expected thing when ridiculously assigned by SDUSD Trustees Bararra, Beiser, Evans and McQuary to investigate herself. Supt. Cindy Marten DOES NOT MENTION THE NAME OF TRUSTEE MARNE FOSTER ONCE! That’s right…Trustee Marne Foster who through her emails, calls and intimidation tactics at the School Site and in the SDUSD Central Office ran an active improper campaign to undermine the SCPA leadership for at least 2-3 years, was COMPLETELY omitted from “THE REASSIGNMENT OF MS. LIZARRAGA” section of her Marten’s Statement! As we did in Part 1 – The Set-Up, we expose the Marten alibis, lies and cover-up attempts by typing the District Deeds Response to Marten in RED. This is a long post and there are FOUR analysis segments. For your convenience we have separated each section with a XXXXXX and the NUMBER of the segment in RED which will allow you to read it in portions. I have not before spoken on the reasons for following the reassignment process of Ms. Lizarraga or any other Principal we have reassigned, out of concerns for privacy. However, in the case of the School of Creative and Performing Arts (SCPA), Ms. Lizarraga has come forward to place these issues in the public arena. We believe the public’s interest in understanding the reasons for our decision to reassign her from site Principal to an arts leadership position in our district far outweighs any privacy concerns an individual might have. The REAL reason for improperly ignoring “privacy concerns” of not only Ms. Lizarraga, but many OTHER SDUSD employees unrelated to the “reassignment” at SCPA…along with the releasing of the name of Marne Foster’s son (breaking FERPA laws) was NOT because of “the public’s interest in understanding“. If that was true, a special Criminal Grand Jury would be convened with subpoena power and the ability to put under oath Marten, Foster and her cronies…Joe Fulcher, Staci Monreal, Melissa Janek, Lamont Jackson, Andra Donovan, Larry Shoenke, Megan Blum, Bernie Nguyen along with her disgruntled complaining spies at SCPA who had been justifiably disciplined for poor performance to get to the REAL truth…and prosecutions. The REAL REASON for the unprecedented CONFIDENTIALITY BREECH by the SDUSD was because the multi-million dollar SDUSD Propaganda Information Office are LOSING THEIR PROPAGANDA CAMPAIGN to exonerate Foster and Marten BY A LANDSLIDE! SEVENTEEN CONSECUTIVE NEGATIVE NEWS ITEMS for Meddlin’ Marne Foster! SIXTEEN MORE CONSECUTIVE NEGATIVE NEWS ITEMS for ELEMENTARY SUPT. CINDY MARTEN! Marten and Board Members Barerra, Beiser, Evans and McQuary tried to use the ONLY weapon that they thought could STOP the SCPA Scandal of Marten illegally taking direct orders from Marten. They BREECHED SDUSD EMPLOYEE CONFIDENTIALITY! In doing so they showed ALL the 13,000+ SDUSD Employees…Teachers, Staff and Administrators…that their personal secrets ARE NOT SAFE with this Superintendent and Board…and their right to privacy can and will be used escape guilt and prosecution to defend the selected inner circle at the TOP of the SDUSD. SDUSD Employees: Do YOU trust Marten with your private records? Yes, I did receive pressure. And let it be known that I receive pressure all the time from many stakeholders to make decisions from their perspective. I hear from community leaders, teachers, administrators, parents as well as board members all the time. Educating our children matters to everyone in our society and people have lots of opinions about what is best for our students and our schools. I welcome input and carefully weigh all voices, interests and opinions. I consider the substance of the input, not the source. Pressure to do things that others want me to do comes with being a Superintendent. However, I will say clearly and succinctly, the pressure I received from a board member did not cause the reassignment of Ms. Lizarraga. Marten’s FEAR of even mentioning Foster’s name in the same sentence as “reassign Ms. Lizarraga is a huge RED FLAG to her guilt. Are the SDUSD Stakeholders supposed to think that SOME OTHER Board Member put pressure on Marten to remove Ms. Lizarraga besides Foster? This is just a very weak attempt by the inept Marten to create some vestige of plausible deniability…and she ends up with an IMPERFECT ALIBI. If this sentence is true, Marten is MORE GUILTY than Foster! Foster at least had a MOTIVE for her deceit, intimidation, improper undermining and intervention at SCPA…her misguided cover-up of her son’s record for financial gain and her unholy and illegal quest for vengeance against anyone who denied her wishes. Marten is saying here that she DID NOT EVEN CONSIDER the illegal opening and sharing of sealed documents by district employees that were created by, and part of, the Foster PRESSURE to oust Ms. Lizarraga in her decision to reassign her. It is clear that this sentence by Marten IS AN OUTRIGHT LIE. But Marten thinks the SDUSD Stakeholders are SO DUMB that they will believe it! SDUSD Stakeholders: Do YOU believe Marten that the pressure and improper actions by Foster did not cause in any way the reassignment of Ms. Lizarraga? Before I share the details regarding the reassignment of Ms. Lizanaga, let me first say that I recognize the gifts and talents she has in the area of perfonning arts. I am aware of and have respect for her national reputation as an arts leader. I am also aware that upon hearing of her reassignment, many staff members, students, and community expressed concern about her departure from SCPA. The “staff members, students, and community expressed concern” when Marne Foster’s son bragged that “My mom and I got Lizarraga fired” at least 4 days BEFORE Principal Lizarraga had even discussed reassignment with Lamont Jackson. NO mention of the impact of Marne Foster’s intimidation of Teachers and Staff OR the impact of the $250,000 fabricated claim…or the direct improper intervention by Marten and Foster to over-ride site decisions and let Foster’s son to blatantly break the rules with no repercussions…THAT is when “staff members, students, and community expressed concern” for the improper and illegal actions sanctioned by Marten. Correction…this is not just a LIE by Marten, it is a RUBY SLIPPER CLICKING, PEARL WEARING, FAUX-SOLDIER FOR 9-11 BABBLING WHOPPER OF A LIE to protect the hides of herself and Foster from prosecution and termination. I am providing this narrative and supporting documents as a means to help the public understand the reassignment process as well as the sources and types of input I received regarding SCPA. I am providing this spotty and false narrative and selected, incomplete supporting documents as a means to help deceive the public into believing my reassignment process lie as well as the slanted and one-sided sources and types of input I used to try to justify Trustee Foster’s and my improper actions regarding SCPA…without mentioning Trustee Foster’s name. I first became aware of campus climate and leadership concerns when I was still the Principal at Central Elementary. One of my former employees had taken a position at SCPA and contacted me shortly after starting in her new position asking if she could come back to Central. She had worked closely with me at Central for ten years. I knew her and her work very well. She was distressed at the climate on the campus at SCPA and specifically the treatment by administration. She shared several incidents about how administration treated employees, parents and students that were of great concern to her. I referred my former employee to make a report to Human Resources at the time. Once I became Superintendent Designee this same employee reached out again with a greater sense of urgency. I again referred her concerns to the Human Resources Chief and to then Superintendent Kowba. Marten “became aware of campus (SCPA) climate and leadership concerns when I was still the Principal at Central Elementary. Dear Cindy hope you’re doing o.k. I just want to let you that I being praying every day for you and all your family. Me my self I’m counting down the days to leave this place, it has been very hard, I just hope that I get place to a better school than (SCPA). So let’s narrow this down a little. Obviously the person TRYING to write this note is NOT a teacher or administrator based on total lack of grammar and writing skills…so that leaves other site personnel…office staff, custodians and food service, etc. Being on the SSC at SCPA, District Deeds DOES remember an SCPA office person that previously worked at Central Elementary. Based on multiple SCPA school site reports, this particular individual had a difficult time writing an email, especially if having to do anything slightly more complicated…like spelling, writing complete sentences or attaching a word document to it. We were shocked at the time since she had spent YEARS under the tutelage of Elementary Principal Cindy Marten…a very high visibility, media hungry Principal at the time. We found out later that interventions like extra training and tutorials had been offered to build up this person’s skills since in the short-staffed front offices of school sites, EVERYONE has to help and pull their weight. Apparently that offer of help by site staff and site leadership was met with RAGE and REJECTION by this individual who refused to learn more to be able to contribute more to the rest of the staff who ended up having to do extra work to make up for this persons deficiencies. But it COULDN’T be the same person that Cindy Marten described as follows in document 5…or could it? She was a dedicated, hard-working employee without a single issue for the ten years I worked with her at Central. Cindy I personally think that she got what she deserve,because she make my work life miserable when I worked at SCPA her and almost the whole administration. Marten DOES NOT share the “many other” emails Marten claims she was sent by her semi-literate former employee with anger issues in Item 5. Marten shares only the ones that fit into her narrative…that this was a highly skilled exemplary former employee of hers who claimed she was being unjustly persecuted…and who just had a hard time spelling, correctly writing a sentence and attaching documents to email. THIS is the individual whose opinion that Cindy Marten claims she “first became aware of campus climate and leadership concerns” at SCPA! This Marten admitted BIASED IGNORANCE to choose to form an opinion from the semi-literate ramblings of her former employee over the ACTUAL facts at the highly successful, nationally renowned, 1,400 student, 6 – 12 Arts Magnet school shows the TOTAL lack of qualifications and judgement by the Elementary Principal who would soon be disastrously placed as Superintendent of the SDUSD…the 7th largest school district in the United States. District Deeds believes that THIS was the FIRST precursor of the Elementary Supt. Marten infamous preference to ignore real credentials, proof and facts that intimidate her and ONLY rely on advice from individuals who had even LESS credentials than herself. Marten finds her perfect Match…the “un-named” Meddlin’ Marne Foster! I, too, found that gossip going back and forth in the released e-mails, between Cindy M. and her former classified clerical worker, troubling. It shows the unprofessional and arbitrary targeting that went on in the removal of 90 principals. 90…that number says it all. Marne has bragged at, school board meetings, that her mother was a dance teacher at SCPA. If so, did Marne’s mother take part in the harassment of the principal?